Musa Basjoo (see picture above). This pale-green leaved banana originates from Japan and can withstand temperatures as low as -8ºC without protection when well established. Careful wrapping up with fleece and protection of the roots with straw or a heavy mulch (or similar) can see even harsher winters endured. The secret is to protect the rhizomes from cold as a Basjoo can grow as much as 2 meters tall in one long summer (remember those?). These are not as tough as the Basjoo mentioned above, only withstanding temperatures down to -1ºC but their deep red foliage make them worth the effort. Both these varieties are best planted as summer bedding making sure you give them plenty of space as they can grow up to 1.5 metres in one season. 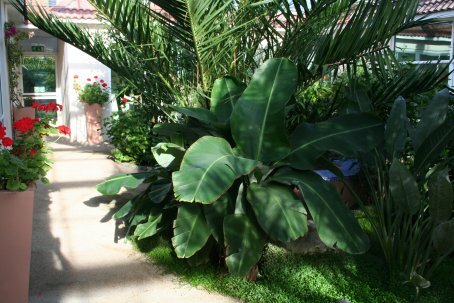 Like all Musaceae plant in full sun or partial shade and sheltered from leaf shredding winds. 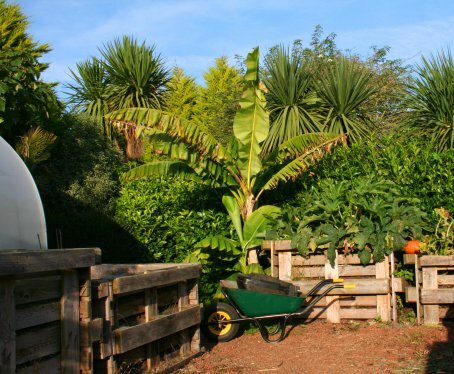 As the name implies these bananas do not grow very tall, about 1.8 metres after a few years growth and they can not tollerate temperatures much below 10ºC, but can withstand lower light levels which makes them ideal as a conservatory/house plant. 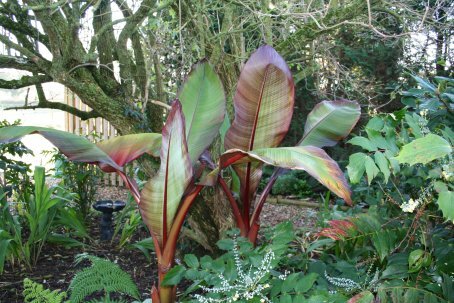 Follow all the same planting rules as for other Musaceae and keep them warm. If possible move outside during the hotest part of Summer.